If you’ve been in a car accident you know how much pain it can bring. Physical effects from an accident don’t always fade with time. 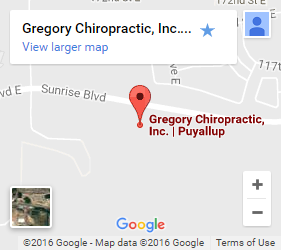 That’s why so many people seek out the services of a car accident chiropractor in South Hill. Using chiropractic methods and directed care, even long-standing pain that’s been plaguing a sufferer for decades can be addressed. You don’t have to go through life hurting. The medical staff at Gregory Chiropractic can help you live a pain-free tomorrow. The true impact of a car accident. Cervical injuries to the spine. Connective tissue tears and rips. Extension and flexion of the neck. Injuries can lead to a wide range of symptoms from pain and stiffness to headaches, prickling sensations, dizziness, and more. Instead of focusing on treating the symptoms, we focus on treating the injuries themselves. We’ll identify the injuries caused by your car accident through training, technology, and diagnostic measures. This can occur in a number of different ways depending on the problem. Nerve and neck mobility issues are often treated with spinal manipulation. Tears and rips need time to heal and paced physical exercise like stretching to maintain functionality. Massage can be crucial for eliminating scar tissue and helping to remedy the negative effects of inflammation. A treatment created specifically for you. Our intake procedures are based around identification and focus on your experience and considerations. Our clinic houses a range of specialists that include a car accident chiropractor. South Hill patients at our facility receive individualized treatment plans that take into account their injuries, bodies, mobility, health, and much more. Medical care isn’t created equally, and treatments aren’t either. Specialized treatments designed for you provide targeted relief and healing for your specific injuries. Contact us if you’ve had a car accident related injury. Whether it occurred 40 years ago, or 40 hours ago, we can help if you are suffering from accident-related pain. Call or contact us to schedule your chiropractic appointment in South Hill today. Tomorrow’s relief begins with a phone call today.